In 2017 Dutch wind energy capacity (4,2 megawatts) was about the same as in 2016. In 2017 total wind capacity was about the same as in 2016. In 2016 capacity of Dutch wind turbines increased by 866 megawatts to 4,257 megawatts. This expansion was realised mainly by finishing some large wind farms on land and at sea. On land capacity rose from 3,034 megawatts to 3,300 megawatts; at sea from 357 to 957 megawatts. Electricity production from wind energy is still more expensive than from natural gas, coal or nuclear energy. Subsidies for wind energy are therefore crucial to investors in wind turbines. Wind turbine owners received 514 million euros in subsidies for electricity production in 2016. 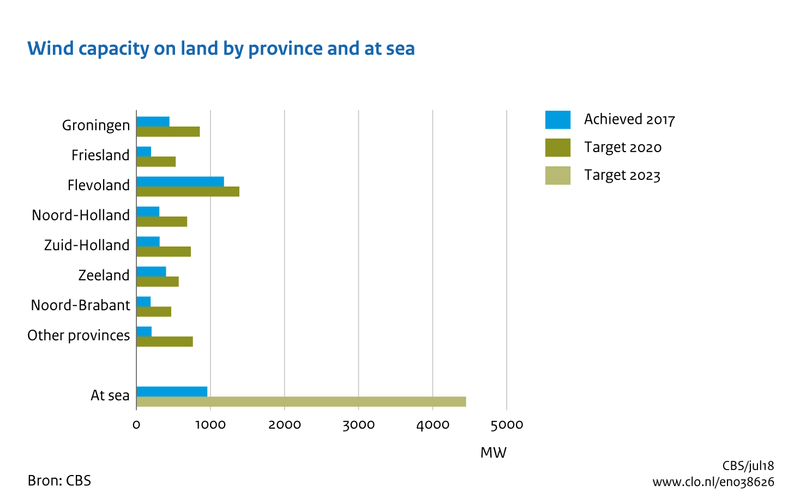 Looking at the distribution of wind turbines on land, it is clear that most are located in the coastal provinces. This is not surprising, given the fact that the wind blows more frequently in coastal areas. However, the wind resource is not the only factor to be taken into consideration in the positioning of wind turbines. Ideas about the way in which they fit into the surrounding landscape also play an important part and this explains why, despite the fact that it is not the most suitable province in terms of wind resource, most wind turbines are found in the province of Flevoland. The Dutch government has projected an overall onshore wind capacity of 6,000 megawatts for 2020, including existing wind turbines. In June 2013, an agreement was reached about the distribution of the 6,000 MW across the Dutch provinces. Permits are granted at the provincial level. The national government is responsible for subsidies. The first offshore wind farm became operational in 2006. The second followed in 2008. In 2015 a third offshore wind farm has becoming operational (Luchterduinen with a capacity of 129 MW). Together, these three wind farms account for about 15 percent of the total wind capacity. North of the West-Frisian islands of Schiermonnikoog and Ameland, the construction of two more wind farms (Gemini, with an overall capacity of 600 megawatts) became realised in 2016. Offshore wind turbines produce more electricity per unit capacity than onshore wind turbines. However, offshore wind turbines are much more expensive. All in all, therefore, electricity generated from offshore wind turbines is more expensive than that from onshore wind turbines (Lensink, 2013). However, a tender for the new wind farms at sea near Borssele shows that expenses for offshore wind turbines will be declining soon. CBS (2018). StatLine: Windenergie op land; productie en capaciteit per provincie. CBS, Den Haag / Heerlen. EL&I (2011). Energierapport 2011. Ministerie van Economische Zaken, Landbouw & Innovatie, Den Haag. IPO (2013). Laatste MW's windenergie verdeeld over de provincies. Nieuwsbericht op website 19 juni 2013. Interprovinciaal Overleg, Den Haag. Lensink, S.M. (2013). Eindadvies basisbedragen SDE+ 2014. ECN en KEMA, ECN-E-13-050. Lensink, S.M., et al. (2013). Eindadvies basisbedragen SDE+ 2014. ECN en KEMA, ECN-E-13-050. ECN, Petten. RVO (2017). RVO Monitor Wind op Land 2016. RVO, juni 2017. RVO (2018). SDE+ Windenergie op Zee. RVO, maart 2018. SER (2013). Energieakkoord duurzame groei. Sociaal-Economische Raad, Den Haag. CBS, PBL, RIVM, WUR (2018). Wind energy capacity, 1990-2017 (indicator 0386, version 26 , 24 July 2018 ). www.environmentaldata.nl. Statistics Netherlands (CBS), The Hague; PBL Netherlands Environmental Assessment Agency, The Hague; RIVM National Institute for Public Health and the Environment, Bilthoven; and Wageningen University and Research, Wageningen.